Posted on October 24, 2016 by Joseph C. Kunz, Jr.
Amazon provides two very powerful and easy-to-use tools to get our books in front of millions of potential readers and buyers. Together these two tools help form the basic foundation of an author’s marketing plan. So, to help get you to start taking advantage of Amazon’s benefits, here is a quick look at the two best marketing and selling tools on Amazon that can help make your book a financial success. 1. You will learn about the two most important Amazon marketing tools that are available to authors. 2. You will learn how to use these tools, in conjunction with your blog and social media accounts, to create a powerful and profitable marketing program. 3. You will learn some of the different aspects of each tool, and how they can work together to make you more money from your books. As an author and self-publisher, it’s absolutely essential that you have a presence on Amazon. And luckily for us, Amazon provides a very powerful and easy way to get our books in front of millions of potential readers and buyers. Even if you use a traditional book-publishing company to publish your book, you still need to have a presence on Amazon. Especially if you expect to sell any books. It’s by far the largest book retailer in the world. Amazon has more market presence, more marketing power, a better website, faster delivery speed, and better customer service, than any other big company in America. AMAZON BOOK MARKETING TOOL # 1. This is the main page for authors in which Amazon allows you to provide your profile, add a video and photos, and link to your blog’s feed. This powerful feature is like having an extra webpage devoted to you and your book. Here you’ll also be able to track your book sales and see all of your customer reviews. 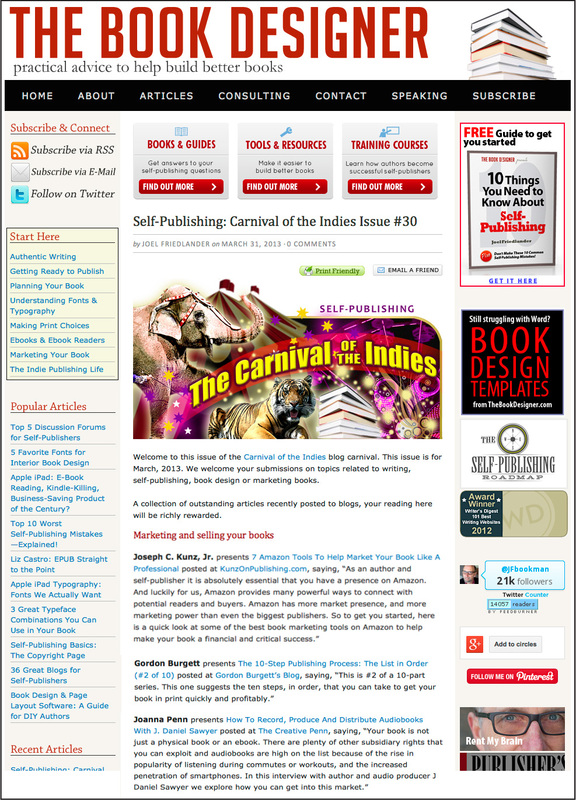 Using Author Central, in conjunction with you blog, will create a very powerful way to market yourself and your book. Having a blog, and an Author Central account, are the very least that you should have for a basic marketing plan for your book. This feature allows shoppers to read parts of your book – such as 10%, or 20%, and so on. 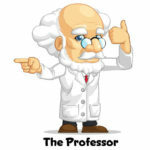 The reader can see your cover, table of contents, index, foreword, introduction, and parts of different chapters. By applying this feature to your book, a buyer can feel more comfortable when choosing to buy your book over another. If you don’t use this Amazon feature, you’ll dramatically hurt your book sales. As an author, it’s absolutely essential that you have a blog. This is where you can discuss your book, and anything related to your particular topic. On your Author Central Page simply type in your blog’s feed (RSS or Atom). Amazon will display a short portion of your most recent blog postings, which will appear on your Author Page that shoppers can view. By doing this, shoppers will be able to quickly visit your blog and see who you are, and what you are about. 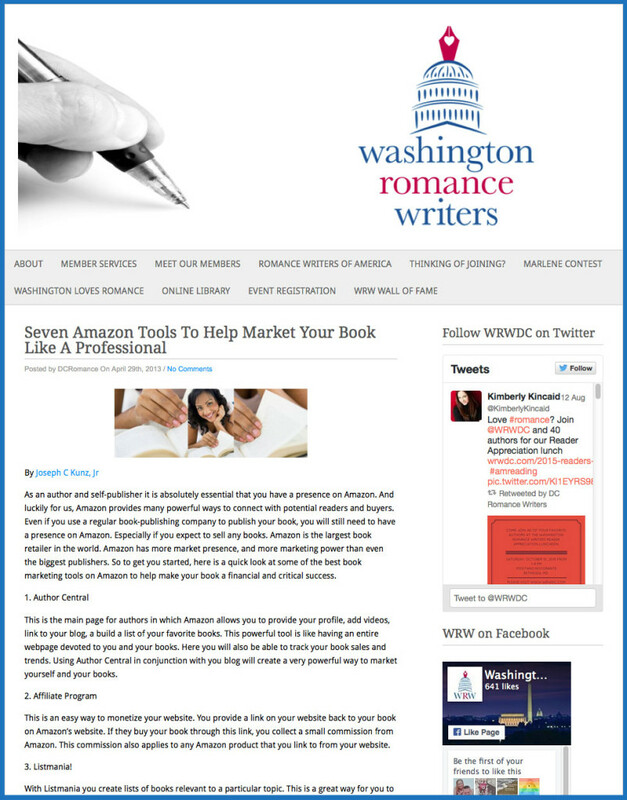 Thank you very much to Washington Romance Writers of DC for posting and linking to my article. It’s imperative that you get reviews posted on Amazon. The more the better. But for the biggest impact, try to get as many positive reviews as possible posted on Amazon during the first few weeks your book initially appears on Amazon. These first weeks can be crucial to helping give your book the higher ranking it needs to help attract more buyers early on. Never stop asking for book reviews from as wide a variety of people as possible. From different demographics, industries, and locations, and so on. There is a direct relationship between the number of reviews received and the number of books sold. More positive reviews will generally equal more sales. AMAZON BOOK MARKETING TOOL # 2. This tool is an easy and painless way to monetize your website. You provide a link, that you create with Amazon’s help, on your website that links back to your book on Amazon’s website. You create this link using Amazon Link Builder. 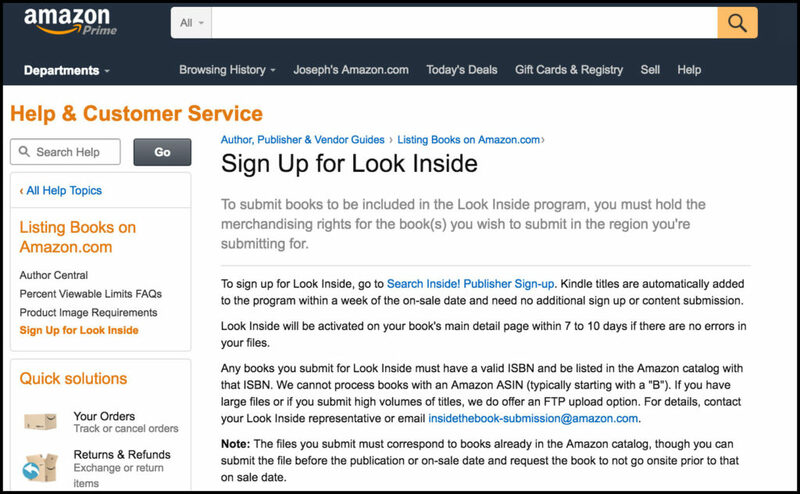 You provide the link to your book’s Amazon page, and Amazon creates the link and adds your special ID to it. Then if someone buys your book through this new link, you collect a sales commission from Amazon. In this way you’re getting your regular cut of the cover price from the sale of your book, and also a sales commission for getting the book buyer to purchase from Amazon by using your link. This commission also applies to any Amazon product that you link to from your website. Amazon will help you build text and image links, as well as advertisement banners. Using Amazon Associates Affiliate Program, in conjunction with your blog, will improve the amount of money you can make with each book you sell. Therefore, whenever, and wherever, you write about or mention your book, make it linkable with an Amazon Affiliate link directly to your book’s sales page on Amazon. 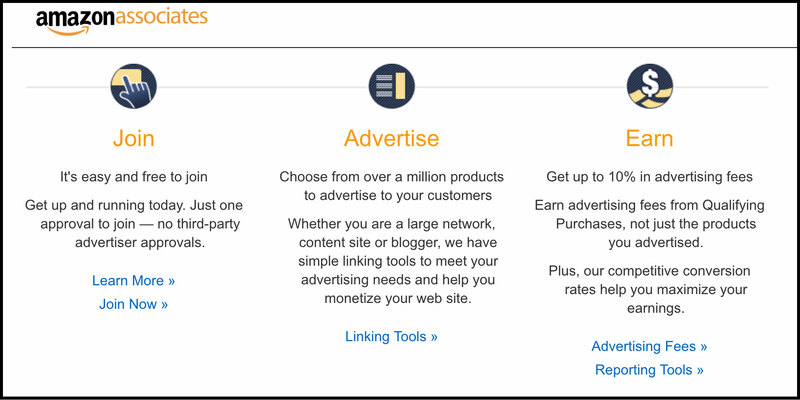 You can also provide an affiliate link on your blog to your Amazon Author Page. Once you set this up, you don’t need to touch it again. To take advantage of these two features, you’ll need to open an Amazon Author Central account, and also an Amazon Associates account. Using both of these accounts, along with your blog, and your social media accounts, will all work together and give you an excellent and easy-to-maintain marketing program. As long as you keep your book current, and be active on your blog and social media, your book will achieve a continual stream of sales. The level of those sales will be determined by how much effort and quality you put into your book, your blog, and your social media. Do all of that, AND give the readers the help AND answers they are seeking, and they will continue to buy your books. 1. What part of Amazon do you find to the most powerful part of your marketing plan? 2. How has Amazon’s Affiliate Program helped you make more income from your book? This entry was posted in Affiliate Marketing, Amazon, Blogging, Book Marketing, Podcast, Reviews and tagged Affiliate Marketing, Amazon, Author Central, Blogging, Book Marketing, Book Sales, Listmania, Podcast, Self-Publishing, Tags. Bookmark the permalink.